I agree - a 5-star film if ever i saw one. 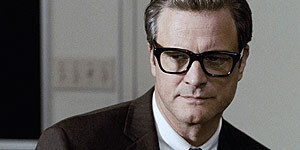 Ravishing to look at, stylistically interesting, beautiful music and a tear-tugging story and central performance by Colin Firth. Can't recommend enough. Can't believe View London only gives this 3 stars - A Single Man is undoubtedly the best film of the year so far. Absolutely stunning from beginning to end. Not a frame is wasted. Visually and emotionaly powerful in a way that only film can be. A must see.